Today my guest is Ron Pattinson. Ron is a historical beer expert focused primarily on brewing in the British Isles. He is the author of some 30 books and also runs a daily blog called Shut Up About Barclay Perkins. His latest book is titled simply “Austerity!”. We start with a discussion of the many mini-books Ron has been working on these past few years about historical beer brewing. He shares some of the trends in brewing and breweries in the austere period immediately after WWII. Ron explains how things changed as the British economy started to grow in the 50’s and 60’s. We discuss tax policy and how taxes can have a significant affect on brewing. Ron talks about the shortage of dollars which led to few imports and how beer production became almost entirely domestically sourced. 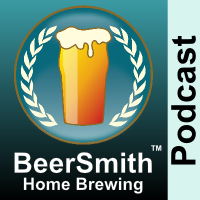 We talk about some of the larger beer producers of the period. Ron shares what a typical English mild recipe might look like. We talk about ingredients including how few breweries had moved to single yeast strains, and many simply reused mixed yeast strains over and over again. Ron shares some of his thoughts on homebrew sized recipes provided in the book and his closing thoughts.